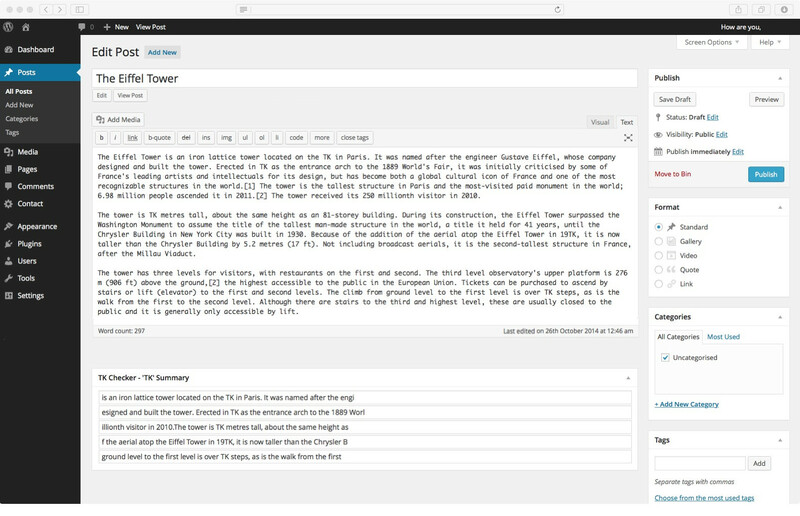 A WP plugin for writers. Auto to-do lists for your drafts! Would you recommend TK Checker to a friend? Here's what an example post looks like when you have TK Checker running Snippets are automatically created underneath your draft You can set snippets to be any length. It can find any marker you wish - I usually use ?? or ** It will alert you if you try to publish a post with markers still remaining You can directly edit in the snippet box and that will auto-update your post. @ChuckReynolds @helenryles Yes, you're right! Lots more screenshots and FAQs to come. This is a really helpful tool for writers! @helenryles What inspired it? @Chikodi @helenryles I kept seeing 'TK' in published posts quite often, where info & links were missing. It was clear that people were using the method but forgetting to replace their missing info markers. I second that. Very cool idea @helenryles. Love this idea. Just purchased! @ChuckReynolds Yes - TK isn't too well known about. Most people invent their own. Touchtypers use QQ, some folks use angled brackets :) all will work in the plugin. Thanks for checking it out!